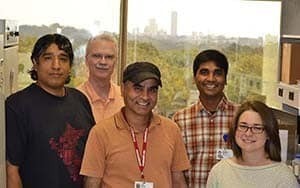 Oct. 16, 2013 | The research team of Kevin Young, Ph.D., includes Daniel Vega, left, Young, Dev Ranjit, Suresh Kannan and Kerry Evans. Oct. 16, 2013 | Although Kevin Young, Ph.D., hopes his research will aid in the practice of medicine 20 years in the future, the National Institutes of Health (NIH) continues to value it in the present. Young, a professor in the UAMS Department of Microbiology and Immunology, was recently awarded a four-year grant for more than $1.9 million by the NIH. Its renewal of grant funding for his research was the fourth one. When the current grant period ends in 2017, Young will have been working for 18 years to find answers that could help renew the effective life of antibiotics in fighting bacterial infection for a future generation of patients and physicians. Starting in 1999, Young started looking into just how bacteria make the cell walls that surround and protect their internal structures. He came to UAMS in 2009 to continue his research using E. coli as a model for other bacteria. Understanding new ways to interrupt that synthesis could lead to a new class of anti-microbial medications or antibiotics. Stopping the synthesis ultimately leads to cell death for most bacteria. Bacterial cell walls, including E. coli, are made up of what Young describes as a sort of mesh bag of peptidoglycan. A biochemical mechanism synthesizes peptidoglycan and makes the wall grow longer or wider around the internal structures of the cells. As bacteria multiply and prepare to divide, they hand off the synthetic enzymes to the cell division mechanism. Antibiotics work more easily during that point in bacterial reproduction. Two tools are proving useful in Young’s search for answers to his questions about the bacterial wall and peptidoglycan synthesis. The first tool is a process called the Spheroplast Assay. In the assay, the cell wall is chemically stripped away. The stripping usually kills the cell, but in some cases, the cell is able to rebuild the cell wall. With the assay, a researcher can watch the cell as it re-synthesizes peptidoglycan to recreate the wall. Sometimes the cells resume their normal shape, but sometimes mutant bacteria can‘t. Studying these mutants promises to help understand how normal bacteria build their walls.. The second tool is Fluorescent Activated Cell Sorting technology. FACS machines use lasers to see the size, shape and chemical makeup of cells. FACS hasn’t been used much for bacterial research, but it’s been adapted at UAMS for this purpose. Young said it was one of the reasons he wanted to continue his research here, and having this capability at UAMS definitely strengthened the competitiveness of the lab for the renewal of grant funding.